As a Milwaukee website design company, we love to predict what trends we will see in the upcoming year. In 2017, we saw simplistic, flat designs with an emphasis on mobile-first. With mobile still a major trend, we believe 2018 will be the year of the user with websites being tailored to increase overall user experience. Take a look at what website design trends will encompass in 2018 and what the focus should be on this year. Optimizing your website for mobile has been a significant trend for a while now and mobile usage continually rises. Google has recommended taking a mobile-first approach when designing your website because most of their searches are being conducted on mobile devices. We agree that designing your website with a mobile-first mentality is important, but we also want to also make sure that desktop viewing is not being forgotten. We recommend reviewing your website analytics and determine what device your key audience is using to browse your site as well as looking at that traffic over the last few years. Mobile-first website design is very different than a desktop-first approach. 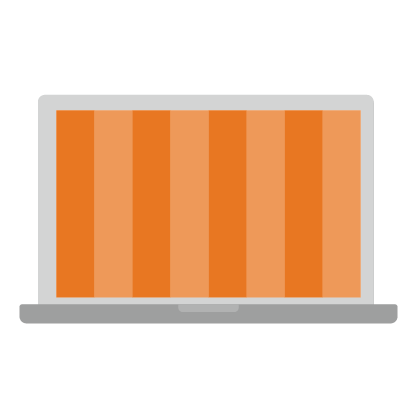 On average, mobile has a roughly 40% higher bounce rate than desktop (StoneTemple). Therefore, mobile browsing must be simpler and to the point. Users are most likely using their mobile data plans to browse and do not want unnecessary steps to view information. Determining the targeted geographic regions to establish the approach to should take should be highly prioritized. You may have high global usage by mobile devices, but if your key audience is located in a smaller local region and has low mobile device usage, it would be recommended to design for optimal desktop viewing albeit maintaining a responsive design for mobile users. Based on the increase in mobile web browsing, scrolling becomes very important in terms of the success of your website. There is a smaller screen available on mobile devices, thereby making it imperative to have scroll implemented. The scroll will be longer on smaller screens. However, make sure your pages are not too long as it can have a negative effect on SEO and usability. Today, users are used to scrolling whether with a swipe on their mobile device or scrolling with a mouse on their desktop. With the large number of devices and variety of screen sizes in use, the days of designing entirely “above the fold” are behind us. The content “above the fold”, however, should be engaging and communicate the company’s positioning as it will be responsible for enticing the user to scroll and explore more of your website. The revival of serif fonts is a common prediction made for the web in 2018. Sans-serif fonts were often considered the go-to for web design as they are easy to read and, compared to their serif counterparts, have more streamlined forms. However, owing to the increase in display resolution, serif fonts are making a comeback (Webflow). Based on higher resolution screens, our eyes are better able to make out the finer features that render serif fonts so unique—the serifs and their variety of shapes and forms. With low-resolution screens, pixelation can cause serifs of the letterforms to blend together until they become unreadable, making sans-serif fonts the route to go. With the increase in display resolution, more and more opportunities are emerging for web typography to expand and become more intricate, providing designers with the potential to experiment more with their designs. In 2017, we saw browsers such as Google Chrome and Safari taking action and auto-playing video with the sound off. As a result of the irritation that comes along with auto-play videos featuring sound, silent videos will likely be much more popular and effective. It strictly eliminates any annoyance and adds to the overall experience on the website. Animated GIFs will also be popular as they yield a more dynamic element over a static and flat design, leading to a stronger brand image and personality. We will see a shift from templated web design to a more custom design based on the content, user, and their experience. We have seen cookie-cutter websites that did not leverage the company’s personality or engage the user—sites that are not typically well-made or maintained. We recommend implementing custom graphics and features that are unique to your brand that manifest a positive and engaging experience. Storytelling is becoming a key part of every website as it engages the visitor and guides them to other areas of the website. Simple pages with large blocks of text are starting to disappear. Content should be designed to be unique, quickly read, and paired with pictures and graphics that have a unique look and feel that matches the culture of the company. Today, making your website responsive is extremely important as people are browsing on multiple devices and many screen sizes. We predict that in 2018, more and more websites will be going full screen and eliminating the two-sided white column layout. When your website is truly taking advantage of the user’s full screen, you potentially have much more space to utilize and your information has breathing room, permitting the eye of the user to transition easily though the content and being overall much more visually appealing. The use of marketing automation is only growing, and we find it being used in a variety of different ways. Briefly, marketing automation is the process of using specific software to collect data about users to more effectively market to your target audience. In 2018, we will see it have a greater impact on website design by creating tailored content based upon the user’s behavioral data collected with the software. It is a way to dynamically change your content to be unique to each user, creating a tailored as well as a more personal and relevant website experience. 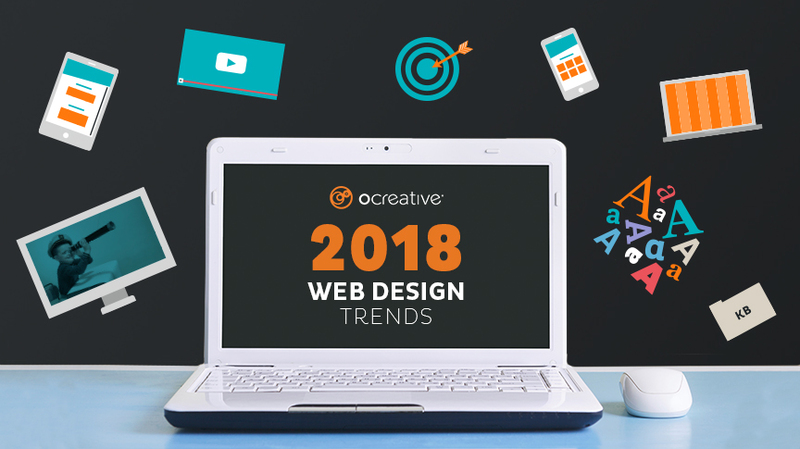 The trends that will arise in 2018 are yet to be determined, but as technology and users evolve, so should your website. Finding the right balance between mobile and desktop design as well as high-resolution imagery and load speed will be keys to success in 2018. Keeping your users’ experiences more in mind and tailoring your design to fit their needs will be best. Ocreative is an integrated marketing agency located just outside Milwaukee that works with clients locally, nationally, and globally. Their clients have access to some of the most fun and knowledgeable professionals around—those who inspire, educate, and problem solve. The agency’s expertise and broad experience have spanned both print and digital medias. They provide marketing and brand strategy, advertising and design, website design and social media, and video expertise to their clients, fulfilling their desire for business growth and their aspiration to leave a substantial footprint on their industry.